We warn you, you are about to find out that barbecues, or asados, are VERY important for Argentinean people. In hostels, they usually take place around the bar and are the perfect opportunity to meet other backpackers who are visiting the city. While you are not pigging out on BBQ, you might want to visit cool places like Caminito, the lovely streets of San Telmo and the beautiful Casa Rosada. In Buenos Aires there’s also one of the most beautiful libraries of the world, the Ateneo Grand Splendid. It used to be a theatre and they kept the original shape, you’ll love it! In Buenos Aires there’s amazing street art – you can see some of it in many hostels, but also in the areas of Palermo, Boca, Barracas and Coghlan. We know that staying in a perfect hostel makes a difference to any trip. That’s why we’ve listened to our backpackers and searched through the reviews to find the best hostels in Buenos Aires. We’ve even classified them, so that you can find exactly what you’re looking for. If you’re solo travelling but don’t really want to be solo, Buenos Aires is a good place for you. Argentinians are super friendly (it’s said that they love to talk to everyone – and it’s true), and in your hostel you’ll find many people from all over the world to share adventures with! This hostel’s social atmosphere is what makes it a great place to stay in Buenos Aires. The staff organise fun activities every day, including tango lessons, football nights and Argentinian BBQs. And, believe us, you want to be there for the BBQ night. The hostel has a bar and an atrium where you can hang out and meet new people ALL THE TIME. There are also private rooms, which are a good option if you want to enjoy the social hostel life without compromising your privacy. In the dorms, there are personal lockers to keep your things safe. A great atmosphere, daily activities and safety, what else could you ask for? With daily fun activities (including Spanish lessons and pub crawls), you’ll never be alone in this lively hostel. If there’s still some time left until the next activity, the rooftop terrace with a small pool is always a good place to find other backpackers. The free breakfast includes everything you need to start your day with energy. But, if you are a real foodie, the hostel offers a breakfast upgrade for a small fee. It’s worth trying it! BTW! If you stay in this hostel, you’ll have discounts for the best bars and clubs in Buenos Aires. Is there anything more romantic than having a drink on a terrace in Puerto Madero? Or walking among markets in San Telmo? Or drinking an Argentinian mate infusion in the rose garden of Palermo? Buenos Aires is definitely a city for lovers, and even more for backpacker lovers! We’ve selected some lovely hostels that are social – but not full of party animals – and have private rooms in case you want to treat yourselves. Decorated with beautiful murals, this hostel looks more like an alternative art gallery. There are plenty of colourful common areas, including a kitchen. You can rent a bike on site, which is a good way to discover the lively neighbourhood of Palermo, which is full of bars and restaurants. The hostel is very clean and the staff are beyond helpful. Located in Recoleta, a lively neighbourhood, popular among young travellers from all over the world. This hostel is close to museums, cafes and alternative shops. The colonial style decoration gives it a glamorous vibe and you can choose to stay in a shared dorm or treat yourselves to a private room. There are common areas (including a rooftop terrace) where you can often find new people to explore the great bars in the area. Around the corner you can find Francia square, where an artisan market takes place every weekend. The hostel is decorated with beautiful murals that give the common areas with an artistic vibe. The main common area is the beer garden, a huge indoor patio where there’s always something going on. Time it right and you could spend the evening listening to some live music, with your new travelling friends. You’ll be staying in Palermo, close to the main nightlife in Buenos Aires and to the most popular attractions of the city. Don’t trust the appearance of this hostel! It may look like a boutique hotel during the day, but the parties that take place at night show that it’s actually a hostel – and one of the best. With lots of common areas to chill out in, including a huge terrace, and planned activities every day, you’ll never be bored. 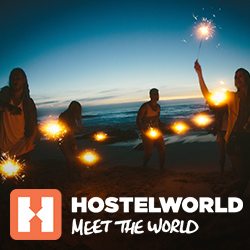 We want to share a few more of our favourite hostels , so if you haven’t found yours yet, it may be here! Even though it’s a social hostel, the atmosphere is relaxed. The staff organise regular activities, especially dinners with traditional Argentinian food (aka BBQ). The staff are great, they can help with tips to explore the area and make sure you have a good time. This hostel is located in San Telmo, which means you can walk almost everywhere, and you’ll be close to the main city sites. A colourful, modern décor is waiting for you in America del Sur Hostel. In the common areas you can play musical instruments, exchange books or have a tea. The daily activities are great, but the real heart of the hostel is the staff. They will make your stay even better with local tips and joining every activity! People from around the world gather every night on the rooftop terrace of this hostel. Is it because everyone is so nice? Is it because of the bar with cheap prices? Who knows. The only thing we know for sure is that every backpacker has fun in Reina Madre Hostel. You don’t believe us? We dare you to try it! Did this post help you find a hostel for your trip to Argentina? We hope so! If you’ve already stayed in any of them, or if you have a hostel recommendation in Buenos Aires, we’d love to hear from you in the comments. Enjoy Buenos Aires!